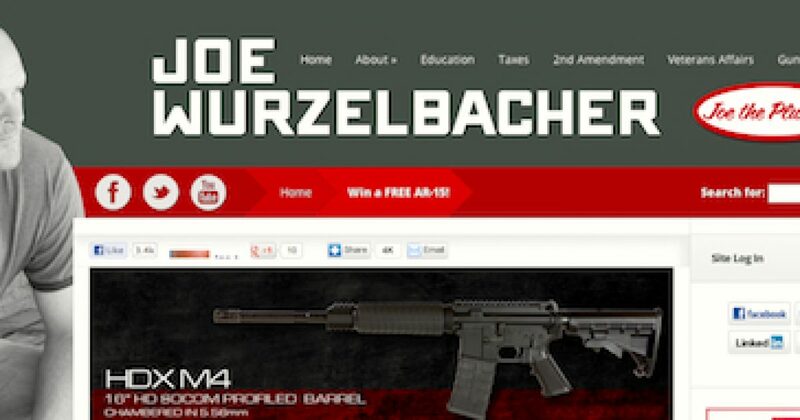 Win an AR-15 from Joe the Plumber! In honor of this magnificent rifle, JoeForAmerica.com is giving away a new AR 15 to the lucky man or woman who wins this drawing. If you support Americans’ right to own the AR 15 and want a chance to win this one, simply register below by submitting your email address. That’s it. Good luck! Entries must be received no later than midnight on March 31, 2013. After submitting your entry, you will begin receiving complimentary updates from Joe for America! No purchase necessary. Contest void where prohibited by law. One entry per person. To enter this website’s contest fill out the online entry form before midnight on the date listed above. Chances of winning determined by the number of entrants. Mail-in entries will not be accepted. Duplicate entries will be discarded. Incomplete entries will be disqualified. To be eligible to win, entrants must be U. S. citizens, residents of one of the fifty United States or the District of Columbia, and be at least 18 years of age. The prize, as described above, will be awarded to a single winner as the only prize in this contest. The winner will be selected in a random drawing held on or after the deadline listed above. The winner will be notified by e-mail and must submit a signed copy of a Federal Firearms License from his or her receiving dealer. The gun will be shipped to the Federal Firearms Licensee designated by the winner. The winner must comply with all federal, state and local laws, and is responsible for all taxes and all amounts charged by the designated Federal Firearms Licensee for receiving the gun and/or processing the transfer thereof to the winner. May the odds be ever in your favor.